The drug is administered in the form of the solution 7%. A vial of powder is dissolved in the water for injection in the appropriate doses – 1.25 ml, 12.5 ml and 125 ml. 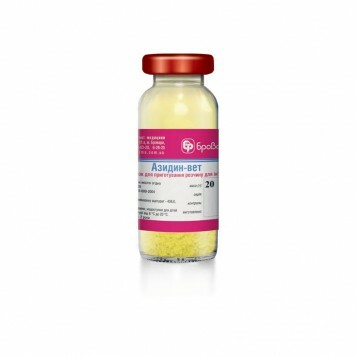 Thus prepared solution of the drug is administered intramuscularly or subcutaneously. For cattle, sheep, goats, horses the therapeutic dose is 1 ml of drug per20 kgof body weight (corresponding to 3.5 mg of diminazene aceturate per1 kgof body weight). For dogs and cats it is recommended to use it in the form of the solution 3.5% (for this purpose the content of the vial is dissolved by double volume of water) and is administered in a dose of 0.1 ml per2 kgof body weight. The inflammatory process in kidneys. After administration, the slaughter of animals for meat is allowed in 20 days. In case of slaughter before specified period, the meat is used to feed unproductive animals or for the production of meat-and-bone tankage. Milk of lactating animals is not allowed to use in food during 3 days after the last treatment. Vials of 0.24, 2.4 and24.0 g.
Store in a place, protected from light, at the temperature from +8°С to 20°С.